In this page we show you some HTML5 slideshow templates available in the Photo Slideshow Maker program, please use HTML5 compatible browser for display. If you are using IE, please update to IE9. You can download the HTML5 slideshow program to see it yourself. 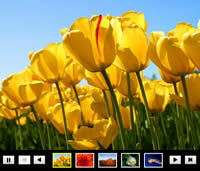 With Photo Slideshow Maker, you can create html5 canvas slideshow in simplest and fastest way. More HTML5 slideshow templates are coming soon!